Greenhouses at a glance is a side by side comparison of all of our greenhouses for sale based on materials, size and prices. We offer polyfilm, polycarbonate, glass and lean to models. This will help you narrow down your search for your new greenhouse. 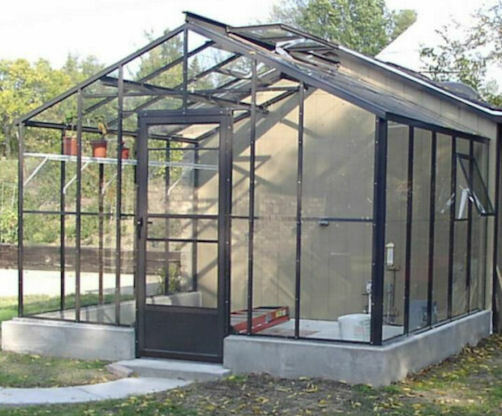 This greenhouse has a charcoal gray powder coated aluminum frame. It is glazed with twinwall polycarbonate in the roof and crystal clear single polycarbonate on the sides for a glass like clarity. $2499.00 ON SALE FOR $2099.00 through April 30,2019. 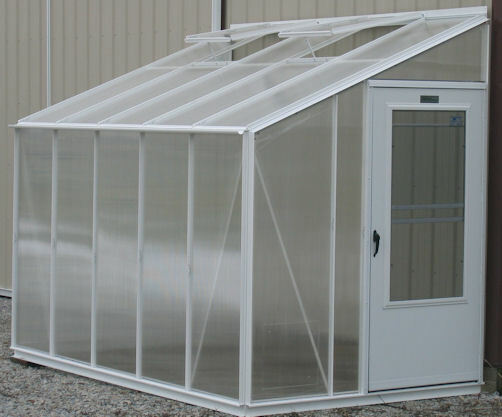 Our Polyfilm Greenhouse has a galvanized steel frame. It comes standard with clear 6 mil, 4 year polyfilm. 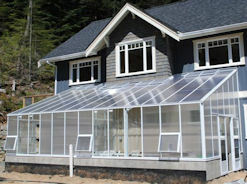 The side roll up curtains shown are a valuable option for this greenhouse. It is available in 3 sizes from 10′ x 11′ to 10′ x 27′. Prices range from $2900.00 to $4499.00. These prices include shipping to Contiguous US. Made in the USA. The double polyfilm greenhouse has a galvanized steel frame. It comes with double polyfilm, an inflation system, an exhaust system, and a propane heater. Everything you need to get started growing. It is only available in one size – 16′ x 24′. Standard pricing includes 4′ sidewalls. Higher 6′ sidewalls are available as an add on. Pricing is $6440.00 including shipping to the Contiguous US. Made in the USA. 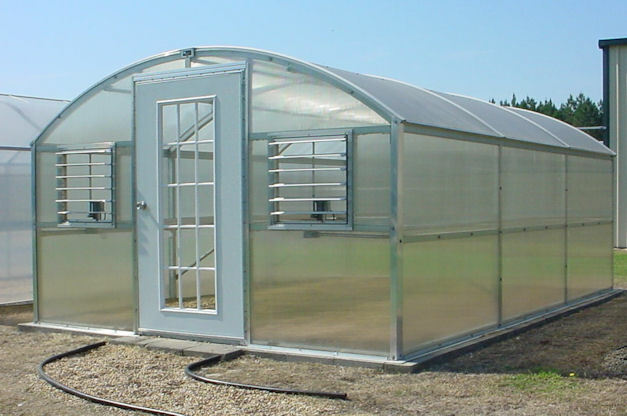 This greenhouse is available in a 30′ x 96′ size. It comes with double 6mil, 4 year polyfilm on the main structure, with a single 6 mil, 4 year polyfilm on the gable ends. 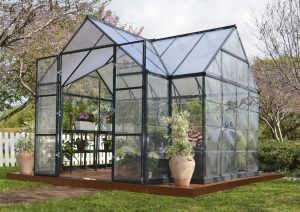 This greenhouse is manufactured in the US. $19,675.00 including shipping to Contiguous US. Our Hexagonal Polycarbonate Greenhouse is a beautiful addition to any yard. It has an aluminum frame and is covered with durable polycarbonate. The roof is twinwall polycarbonate, while the side walls are clear, see through polycarbonate. $1396.00 including shipping to Contiguous US. 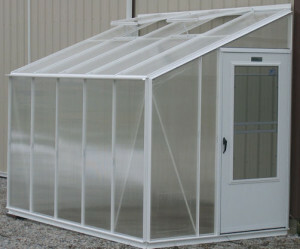 This greenhouse is available in a Mill, White or Green Aluminum Frame. It is glazed with twinwall polycarbonate. 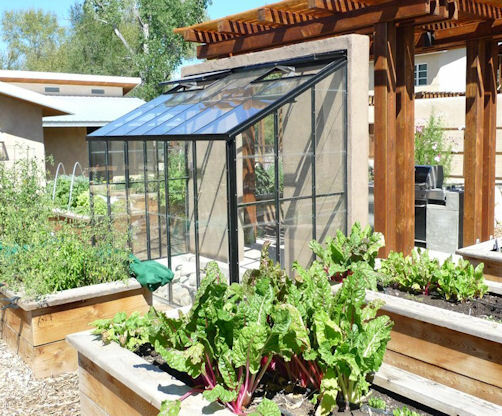 A ventilation package is included with this greenhouse, making it a super buy. 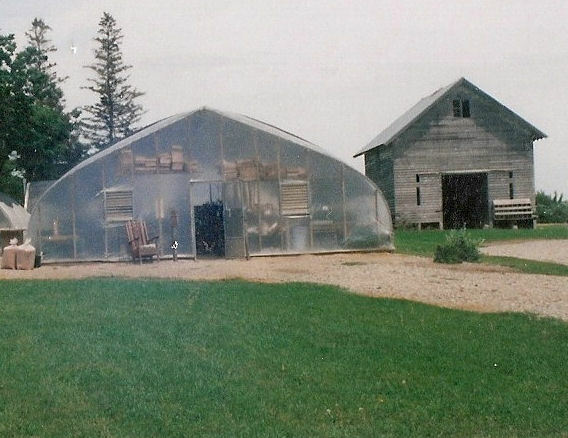 Also, this greenhouse is Made in the USA. Sizes start at 8′ x 8′ and go up to 10′ x 16′. Prices range from $2650.00 to $5194.00 including shipping to the Contiguous US. 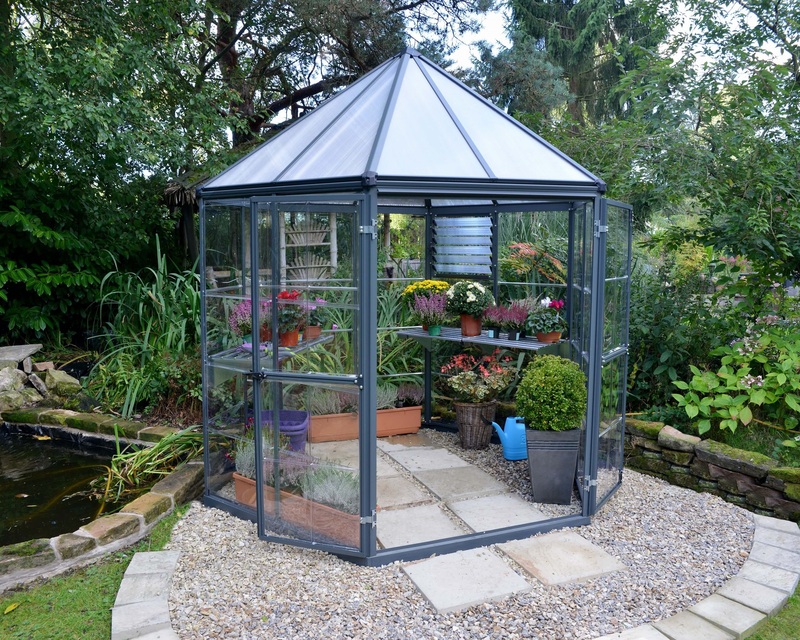 This greenhouse is available in 12′ or 16′ widths. Lengths are between 12′ and 30′. The frame is a curved galvanized steel frame with aluminum extrusions. The glazing is 8mm clear twinwall polycarbonate with a 15 year warranty. 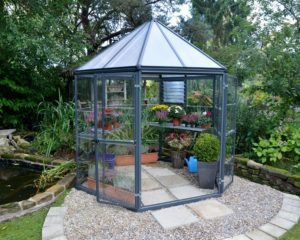 This greenhouse has many accessories available, including stationary benches, heating and ventilation packages. Pricing runs from $6532.00 to $11,412.00 including the shipping to the Contiguous US. Made in the USA. 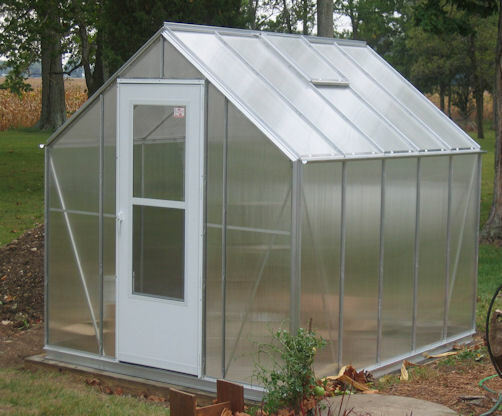 The Evangeline Greenhouse is available in a white, brown or green aluminum frame. We also have the ability to custom match any color of your choice. The greenhouse starts and 6′ wide and goes up to 20′ wide. The length are available from 6′ to 50′ and up. 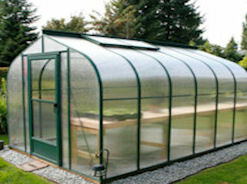 This greenhouse is glazed with a twinwall polycarbonate. Curved or straight eave styles are available. Many customizations are available on this model. We can customize the length, width, eave height, do a custom placement on the door, etc. Prices start at $4728.00.00 including shipping to the Contiguous US. This is a truly top of the line greenhouse. It is available in a white, brown or green powder coated frame. All of the glass is tempered glass. 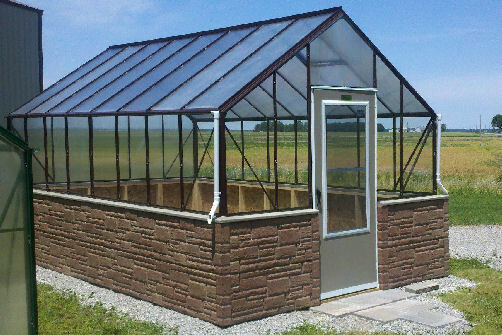 This greenhouse is rated for 32 psf snow load and 85 mph wind load. There are a number of customizations available on this model. Prices start at $3560.00 including shipping. This model has all of the same great features as the straight eave Acadian Greenhouse. All of the glass is tempered, including the curves. 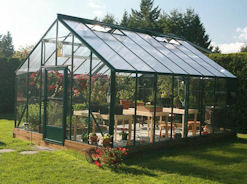 This greenhouse is available in single or double glass. Pricing starts at $8587.00 including shipping to the Contiguous US. This greenhouse is all polycarbonate, but with the glass like clarity on the side walls. The roof is twinwall polycarbonate. The sidewalls are 3/16″ thick clear polycarbonate. Sizes are 6′ or 8′ wide. The lengths are 10′, 12′ or 16′. Standard frame colors are white and green. Custom colors available. Pricing starts at $3134.00 including shipping to Contiguous US. The Evangeline Lean To is available in a curved or straight eave. Standard frame colors are white, brown or green aluminum. We also offer custom color match. 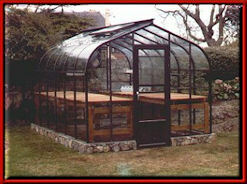 We are able to customize this greenhouse to your needs. We can customize the length, width, attaching height, door placement, etc. Size are from 6′ to 10′ wide, and from 6′ to 50′ plus long. Prices start at $4292.00 including shipping to the Contiguous US. 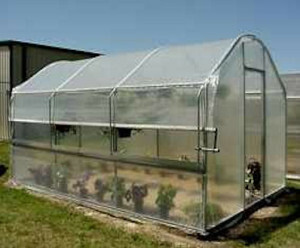 This greenhouse comes with a white or green aluminum frame. It is glazed with clear twinwall polycarbonate. This attached model only comes with the straight eave. 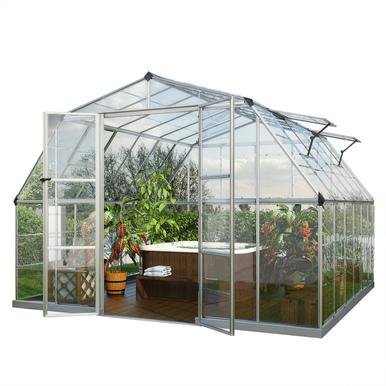 An exhaust fan and thermostat are included in the price for this greenhouse. You have the choice of which gable end you would like the door to be on. Sizes range from 6′ x 10′ to 8′ x 16′. Made in the USA. Prices from $2603.00 to $3653.00 including shipping to the Contiguous US. 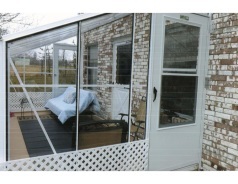 The Acadian Lean To is available in a curved or straight eave. Standard frame colors are white, brown or green aluminum. We also offer custom color match. We are able to customize this greenhouse to your needs. We can customize the length, width, attaching height, door placement, etc. Size are from 6′ to 10′ wide, and from 6′ to 50′ plus long. Prices start at $4972.00 including shipping to the Contiguous US. We are able to fabricate a gable end attached greenhouse for you using our Evangeline or Acadian greenhouse.